The one-mile paved mountainside course contains both straight and curved sections that allows drivers to practice steering and braking maneuvers at a variety of speeds. 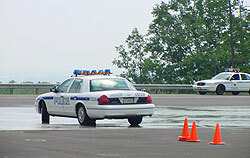 The curved and banked course simulates roads conditions officers commonly encounter while on patrol in southwest Virginia. The 50 by 100 foot concrete skid pad also provides for valuable hands-on training. To enhance the skid experience, the surface of the pad has been treated to reduce traction. In addition, the surface can be wet down with an underground water sprinkler system. With these resources, students can quickly develop the skills needed to correct and overcome a controlled skid. The classroom, capable of seating up to 25 persons, is approved by the Virginia Department of Criminal Justice Services (DCJS). Audio visual equipment for classroom presentations is available upon request. 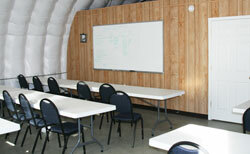 These courses require little setup time and are easily established by following the existing painted layout. 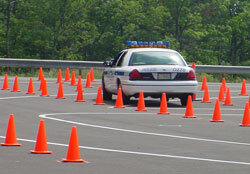 A Roanoke County Police Department Driving Instructor (DCJS Certified) will serve on-site as a safety compliance officer and will be available to assist in supporting the training objectives.